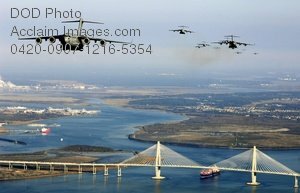 Description: Free, public domain image: Fifteen C-17 Globemaster III Planes Flying Over the City of Charleston SC. Fifteen C-17 Globemaster IIIs from Charleston Air Force Base, S.C., fly over the city of Charleston's Arthur J. Ravenel Bridge Dec. 20 during a training exercise. (U.S. Air Force photo/Staff Sgt. James L. Harper Jr..